Conservative politicians in Cold-War West Germany set up an illegal domestic intelligence agency in order to spy on their political rivals, a forthcoming book claims. In Destroy After Reading: The Secret Intelligence Service of the CDU and CSU, German journalist Stefanie Waske exposes what she says was an elaborate plot to undermine West Germany’s rapprochement with Soviet-dominated Eastern Europe. The book, which is scheduled for publication in February of 2013, claims that the illegal intelligence agency, known as ‘the Little Service’, was set up by politicians from Germany’s conservative Christian Democratic Union (CDU) and its sister organization, the Christian Social Union of Bavaria (CSU). The two parties allegedly founded ‘the Little Service’ in 1969, in response to the election of Willy Brandt as German Chancellor in 1969. Brandt, who was leader of the center-left Social Democratic Party of Germany (SDP), was elected based on a program of normalizing West Germany’s relations with Eastern Europe. Under this policy, which became known as ‘Neue Ostpolitik’ (‘new eastern policy’), Brandt radically transformed West German foreign policy on Eastern Europe. In 1970, just months after his election, he signed an extensive peace agreement with the Soviet Union, known as the Treaty of Moscow, which was followed later that year by the so-called Treaty of Warsaw. Under the latter agreement, West Germany officially recognized the existence and borders of the People’s Republic of Poland. 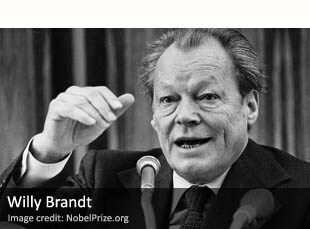 Brandt’s Neue Ostpolitik, which continued until the end of his tenure in the Chancellery in 1974, earned him the Nobel Peace Prize for his efforts to achieve reconciliation between West Germany and the countries of the Soviet bloc, primarily East Germany. But Brandt’s policy of rapprochement alarmed the CDU/CSU coalition, says Waske, which quickly set up ‘the Little Service’ by enlisting former members of Germany’s intelligence community. Intelligence operatives were allegedly tasked with infiltrating the SPD and Brandt’s administration and collecting inside intelligence, which could then be used to subvert both the party and its leader. According to Waske, ‘the Little Service’ eventually established operational links with conservative groups and individuals abroad, including Henry Kissinger, who at the time was National Security Adviser to United States President Richard Nixon. One of the book’s most controversial allegations is that, in one of his communications with ‘the Little Service’, Kissinger entertained the possibility that the CDU/CSU coalition, with the assistance of the German military, might overthrow the government of Willy Brandt, though “it remain[ed] to be seen whether this would involve risks”, he argued. Waske alleges that the illegal intelligence network continued its operations until 1982, when CDU politician Helmut Kohl was elected Chancellor of Germany, thus ending fourteen straight years of rule by the SPD.